While the wall separating the borders is important and would be a deterrent to those wanting to come into the U.S.A. who should not be here, such as smugglers bringing in drugs and trafficking human beings into this country for prostitution, a much more important wall should be considered. The State of California should be totally fenced in so nobody can get out and infect the rest of the country. The State of California has been described by column contributor, Lawrence Craig, who sees California as, “The largest Insane Asylum in the World. He may have something there. Have you noticed the laws being passed there? 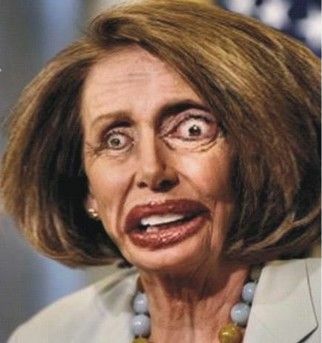 Remember the Queen of California, Nancy Pelosi, stating to congress: “Just pass the bill, THEN you can see what’s in it.” Remember former Governor Moonbeam who declared that people with AIDS CAN give blood. If you can remember, in California it is LEGAL to go anyplace in the city while stark naked! That’s right, you might be eating in a restaurant with your family and this naked dude comes in and plops down at the table next to you. The LGBT crowd is so prominent in the city that they have their own flag. It is interesting that the L.A. Times revealed these stats which SHOULD be of great interest to all thinking Americans (which of course excludes Democrats). And remember that this is all about ONE STATE. 2. 96 percent of warrants for murder in Los Angeles are for illegal aliens. And we allow this to happen? And this is only one State. The reason? Nancy Pelosi wants them to become Democrat voters, which will do it every time. Nancy Pelosi wants to put a Windfall Tax on all stock market profits (including Retirement fund, 401K and Mutual Funds)! Alas, it is true – all to help the 12 Million (only 12 million?) Illegal Immigrants and other unemployed Minorities! This woman is out of her mind!!! We are grateful to Lawrence Craig who tipped us off on these stats.